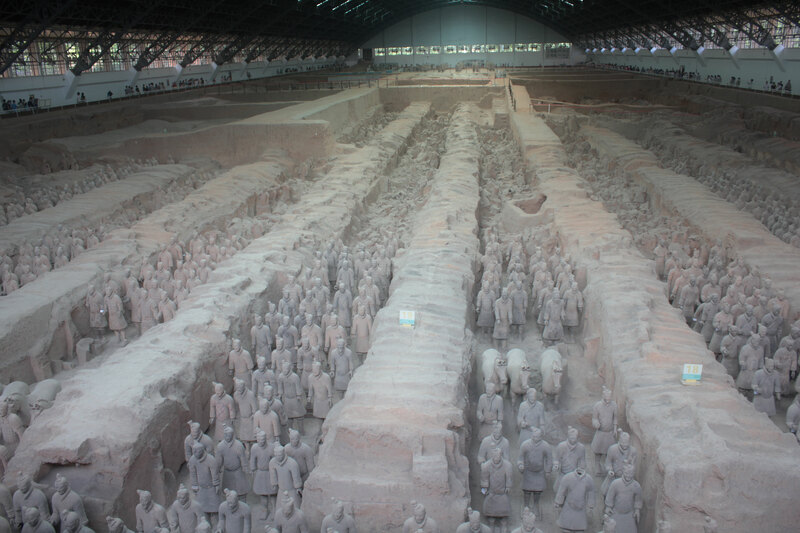 The decision to build Museum of Qin Terracotta Warriors and Horses (秦始皇兵马俑博物馆) appeared right after the discovery of the Terracotta Army in 1975, but the museum was finally open in 1979, though not finished completely. There are still a lot of warriors, horses and other sculptures underground. This is because the excavation is quite expensive, but also because the paint on the statues, after digging and coming into the contact with the air, lasts for a short time. There is still no technology that ensures long lasting of the color on the sculptures, after getting in touch with the air. The museum covers an area of 16,300 square meters, and it is divided into three sections: Pit 1, Pit 2 and Pit 3. The first one is the largest, and was opened to the public on China’s National Day – 1st October, 1979. It contains the main army of more than 6,000, and it is230 meters long and 62 meters wide. The second one contains more than one thousand warriors and 90 chariots of wood. Pit 3, with 68 warriors, a war chariot and four horses, presents the last unveiled part of the museum for the public, and the smallest at the same time. It is recommended to start the tour of the museum from the entrance moving to the right, and going through the Exhibition Hall of Ancient Weapons, Exhibition Hall of Bronze Chariots and Horses, Pit 2 and Pit 3, and leave the largest and the most extraordinary Pit 1 for the end. You will find the Exhibition Hall of Ancient Weapons immediately on the right side when you cross the gate of the museum. The exhibition of the ancient weapons, such as dagger-axe, tomahawk, spare and swords, will astound you, as well as the fact that near 40,000 of bronze weapons is still unexcavated from the pits. The Exhibition Hall of Bronze Chariots and Horses contains two bronze chariots and horses, where the front one is called “High” and the other the “Security” Chariot. It is considered that they are the largest and best-preserved bronze chariots and horses in the whole history of Chinese archaeology. Near Museum of Qin Terracotta Warriors and Horses is Qin Shi Huang Mausoleum (秦始皇陵), which can be visited for free if you purchase a ticket for the museum. You can visit museum with a one of many agencies in Xi’an for aroundCNY300. Price usually includes transportation, tickets for the museum, and tour guide. Info about exhibits is written mostly in Chinese and English. However, taking tour guide (CNY100-150) is highly recommended, because there is so much you should hear and learn about this magnificent site. Audio guides (CNY40; CNY200 deposit) are also available. Museum is accessible to wheelchair users. There are clean, free toilets inside museum, as well as refreshments, Chinese restaurants, and KFC. Don’t forget to cash-up before you head to the museum, as there are no ATMs near the complex. There are abundance of souvenirs shops and stalls in the museum and between parking lot and museum, but you can find better deals in Xi’an. Visiting museum on your own is very easy. Bus number 306 (8:00-18:00; CNY8; about one hour drive) from the east parking lot of Xi’an train station will take you to near the museum. Parking for buses and cars is a 15 minutes’ walk from the museum.